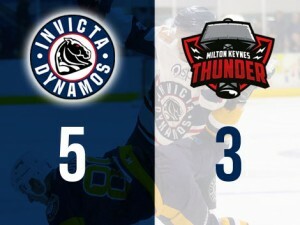 It was a first home win of the season for the Invicta Dynamos as goals from Callum Best (2), Brandon Miles, Arran Strawson and Ondrej Zosiak sealed the two points against the Milton Keynes Thunder in Gillingham on Sunday. Dynamos took to the ice near full strength with the addition of Luke Thirkettle helping counter the absence of Ryan Giles. Milton Keynes Thunder were without Grant McPherson, Oliver Lord, Michael Stratford and Ross Green. First period begun as Dynamos forward Oskars Ancitis tried his luck with shot on Tom Annetts. Ancitis then went in for the rebound on the backhand but the netminder deflected the puck away. The hosts eventually opened the scoring with a goal from Callum Best at 09.36 – Ancitis passed the puck across the ice to Best who scored with a one timer at the back post. Thunder put pressure on the Dynamos as they tried to even the score – Sean Norris with a wrist shot from the high slot but Connor Morris pulled off a glove save. Down the other end Best took control of the puck and dangled through the Thunder defence but his shot missed the net. End of the first period and the Mos led 1-0. Second period begun with a goal from Brandon Miles as he was slotted the puck home from right in front of the net at the second attempt to double his team’s lead – the goal scored at 21.46. Milton Keynes were desperate for their first goal and almost scored it with Ross Bowers left alone in front of the Dynamos net but Morris deflected his shot into the safety of the corner. A two minute high sticking penalty on Morgan gave the Thunder a powerplay opportunity and Tomas Rubes collected a rebound from a teammate’s slapshot before roofing over Morris for a powerplay goal at 26.38 that cut the deficit to 2-1. Not long after, MK tied the game at 2-2 on 32.17 – Rubes dancing past the Dynamos defence and firing low into the net. The Dynamos were quick to retaliate with a powerplay goal at 33.28 – Ondrej Zosiak sent a blue line slapshot towards Annetts and Arran Strawson tipped the shot into the net right in front to put the hosts back in front. Another powerplay opportunity then followed for the Mos as Hallden Barnes-Garner was penalised for hooking and, on the man advantage, Best skated down the boards and sent the puck over Annetts securing a 4-2 lead at 37.33. Before the buzzer Norris went down behind the play and stayed down but officials were not sure what caused the Thunder player to fall so no penalty was called. End of the second period and the Dynamos led 4-2. In the final frame Dynamos forward Louis Colvin forced a turnover behind the Thunder net and shot from close range but Annetts saved. Soon after Strawson tried for his second of the night as he dangled past Greg Randall but could not get an effort on target. Dynamos continued to pressure the Thunder as Ancitis planted a huge hit on Oliver Stone against the boards. Despite a positive start from the hosts, Milton Keynes import Leblanc skated to the crease and managed to beat Morris on the backhand allowing the Thunder to close the gap to 4-3 at 49.09. Dynamos were given another powerplay opportunity as the visitors picked up a two minute bench penalty for abuse of official. There were several shots from the Mos – wrist shots from Colvin and Strawson as well as slapshots from Zosiak and Anthony Leone – but no further breakthrough. Thunder thought they had equalised at 54.06 after a scramble in the crease ended with the goal light on and the puck somewhere between goalie Conor Morris and the post but the officials washed out the effort unclear if the rubber had crossed the line. After the restart Leone landed a huge hit on Rubes that sent them both to the ice but the pair return to their feet laughing about the matter. With time now winding down, the Thunder called for a time out which resulted in netminder Annetts remaining on the bench. TO tilt the momentum further in their favour, with just over one minute remaining, Best was given a two minute elbowing penalty allowing the game to continue 6 on 4 with the MK net still empty. In the dying moments the unguarded net was found – Zosiak chased down a clearance faster than the retreating Thunder defencemen before sending a wrist shot into the twine for 5-3 with 33 seconds remaining. Come the buzzer the euphoric Dynamos had finally secured themselves a home win – their second victory of the season over Milton Keynes. 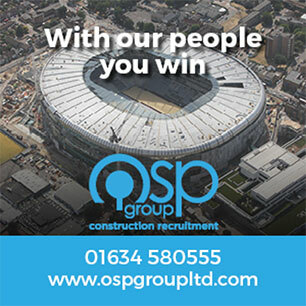 Dynamos: Callum Best 2+2, Zosiak 1+2, Brandon Miles 1+0, Arran Strawson 1+0, Oskars Ancitis 0+1, Louis Colvin 0+1, Ryan Morgan 0+1. Thunder: Tomas Rubes 2+0, Trevor Leblanc 1+0, Alex Whyte 0+1, Sean Norris 0+1.